I had been wanting to revisit this gem from Sarah Dessen for quite some time, but I always feel a little guilty re-reading books. Why? I don't know. It doesn't make any sense and it's probably not a sane thing to feel guilty about, but I'm Emily, and by golly, I have a guilt problem. I could say I'm working on it, but that would be a bit of a lie and would inevitably end in my feeling even more guilty. I think it's a librarian thing. Too many books, too little time. I've gotten off track. Anyhow...this is my all-time favorite Sarah Dessen. It was my first foray into the author's work, but book after book (which I adored), I always came back to this story as my favorite. 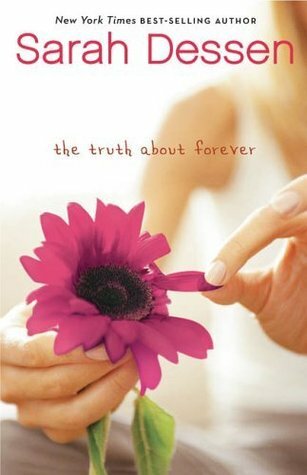 Thank goodness (for my guilt problem) a book club I'm involved with chose The Truth About Forever for its April read. Yay! Macy is grieving over the loss of her father. She wants desperately to be perfect for her mother who is also grieving. They live a quiet, structured, predictable life together. But Macy's life is turned upside when she meets the catering crew from Wish. They are loud, chaotic, and loving, and they welcome her into their family with open arms. Macy comes to realized that life is perfect. That terrible things happen. That forever can last a minute or a hundred years, so you'd better make the most out of the time you're given. Yep. Love this one. I love how the relationship between Macy and Wes is genuine. It's not built on instant lust or bickering or some bad boy who treats the girl horribly. They grow a relationship through communication. They actually get to know one another, and Wes is a heartfelt, sincere guy who doesn't push or judge. I love the Wish crew. They're a bit crazy, but in the most wonderful way. They actually care about one another and embrace the crazy because it makes life interesting. It's the kind of group that you actually want to be around whether sitting on the couch watching a TV show about the apocalypse or hanging at a party. I love Macy's mom. Yes. She seems a bit cold and stand-offish, but she's a perfect example of how people grieve differently. She's doing what she needs to do to cope with the loss of her husband. Not, it's not fair to Macy, but it's loss and pain and grief and it hurts. She's hurting. But she finds her way out. Not instantly, which I loved as well. It's a process, and at the end of the book you can see she's taken the first step. She's not a terribly parent. There are tons of truly terribly parents in teen lit. She's a woman doing the best she can. At this point in the review you must be asking "Is there anything you didn't love, Emily?" I didn't love the library. "What?!" I know. I love libraries. But this library didn't make sense. Who puts high school students on a public service desk without supervision? And who allows them to play lectures and programs for the library? Where is this library? What is going on? Nope. Not realistic.